Bits or pieces? : Of Peace, War and Wonder vs Company Age. Of Peace, War and Wonder vs Company Age. One of the more interesting discussions in recent times has been Prof Jill Lepore’s arguments against Clayton Christensen’s concept of disruptive innovation. In her now famous New Yorker article, Lepore argued that disruptive innovation doesn’t really explain change, but is instead mostly an artefact of history, a way of looking at the past and is unpredictable. This really is a non-argument because both Christensen and Lepore are correct. The problem stems from the issue that there are two forms of disruption - one of which is predictable and one which isn't. The two main forms of potential disruption are product to product substitution and product to utility business model substitution. 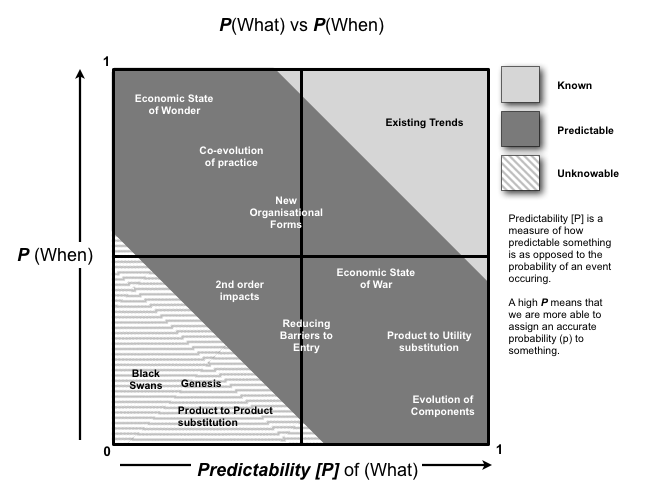 With product to product substitution then the predictability of when (depends upon individual actors’ action) and what (genesis of some new feature or capability) is low (see figure 1). This means a new entrant can at any time create a disruptive product but a company will have no way of ascertaining when that will occur or what it will be. So whilst disruption will occur (as Christensen points out), it is unpredictable (as Lepore points out). Apple’s iPhone disrupting the Blackberry is a good example of this type of disruption. With product to utility substitution the “what” and “when” can be anticipated. Hence a new entrant can more effectively target a change to disrupt others. However, it also means an existing player can effectively mount a defence having prior knowledge of the change and time to prepare. Fortunately for the new entrants, the inertia faced by incumbents in terms of existing business models, developed practices, technological debt, behavioural norms, financial incentives to Wall Street expectations and self interest are often insurmountable, so the start-ups often win. Hence, whilst the change is entirely defendable against (with often many decades of prior warning) companies fail to do so. This form of disruption is entirely predictable and it is here where Christensen's theory excels. Now product to utility substitution is a key part of the commonly repeating cycle of peace, war and wonder that we've discussed extensively about. The 'war' element can be anticipated and the cycle occurs both at a macro and micro-economic level. 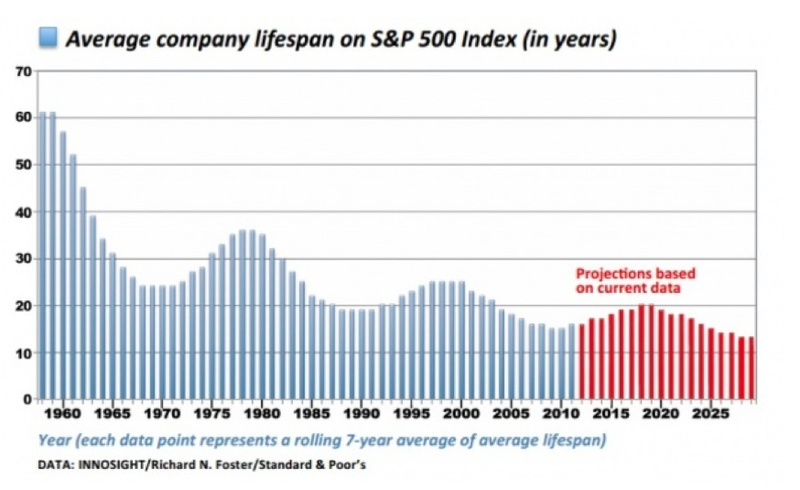 You can even model out the potential impact of this cycle on company age. 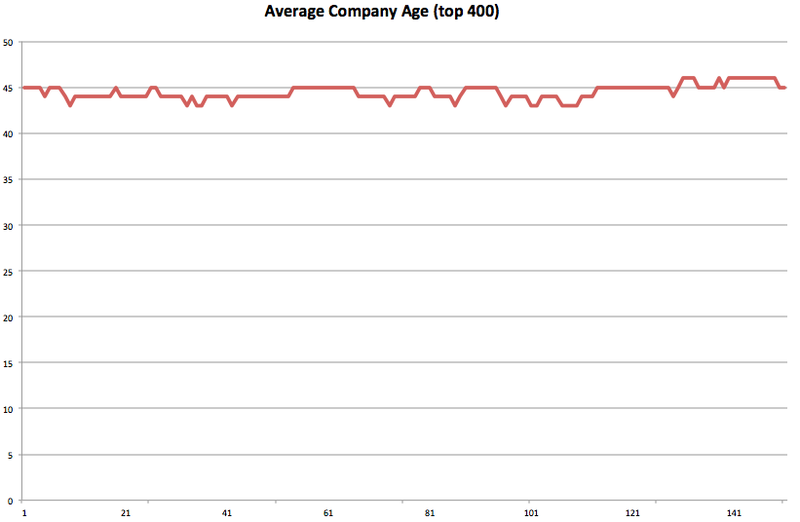 Creating a simulation with 1,000 actors, assuming all actors are in competition, that the largest companies start with an age of 45 years, there exists some unpredictable disruption from product to product substitution and no peace/war/wonder cycle then you can graph out the emergent change of company age with the top 400 due to new entrants and previously successful companies failing. I've provided the output of such a simulation in figure 2. In the above the average age remains fairly constant over time (shown as sequence steps of the model on the x-axis with each step of the model being analogous to a year). 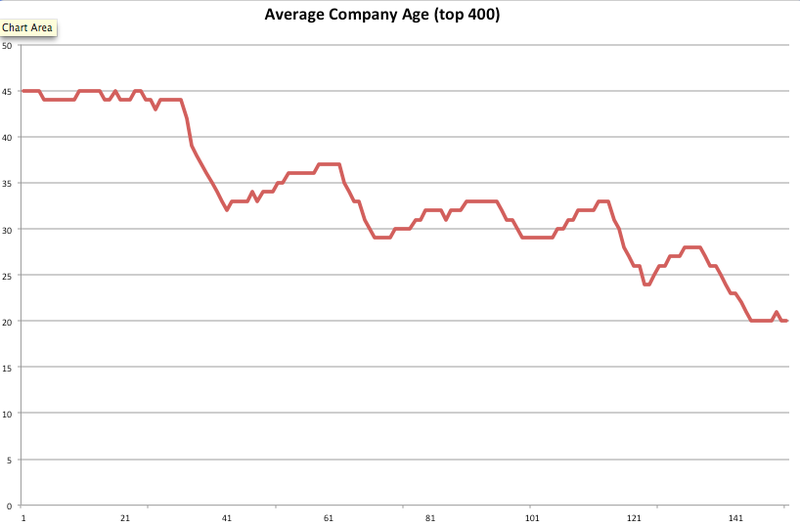 This is because whilst companies age, there is some substitution by new entrants counteracting the growing age. This requires a set of specific conditions including a moderate level of disruption from product to product substitution (3% p.a.) but I'll use this simulation as our base line. By adding in the peace / war and wonder cycle, starting with a condition of 30 steps (e.g. years) for an act to evolve from genesis to commodity and 10 steps (e.g. years) for a commodity to disrupt an existing industry then the following pattern (figure 3) emerges. 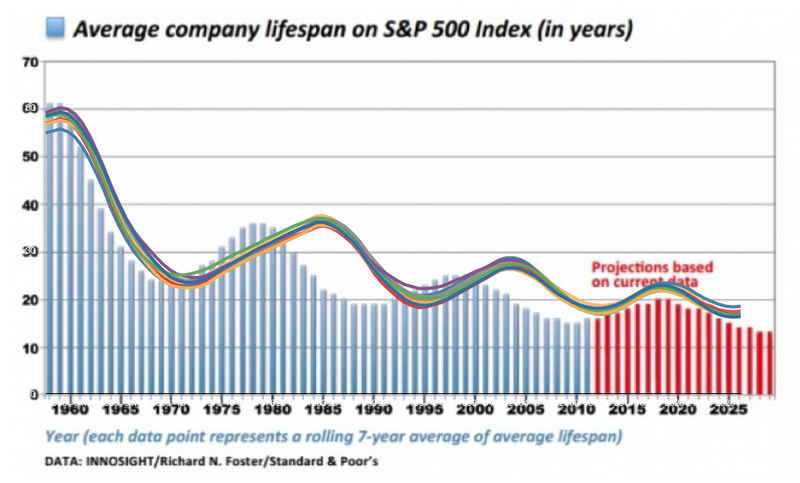 What's happening now is a constant undulation in average company age as the environment moves through these cycles. It constantly attempts to return to a higher average age but the constant 'war's and disruption by new entrants (on top of the normal product to product substitution) keeps this in check. Of course, one of the interesting aspect of the peace, war and wonder cycle is that this not only affects all activities, practices and data but these components can be communication mechanisms. Such communication mechanisms (e.g. telephone, postage stamp, Internet etc) will increase the rate of diffusion of information which impacts the speed at which evolution occurs. This in turn accelerates the speed of the peace, war and wonder cycle. Rather than a case of we are becoming more 'innovative' as a species, it appears that the speed at which things industrialise (i.e. evolve to more commodity and utility forms) and hence the rate at which we are forced to adapt and move onto the next wave has accelerated. If you now add this communication impact into the simulation (i.e. assume some of those peace, war and wonder cycles impact communication causing a subsequent higher speed of future cycles) then the following pattern emerges (see figure 4). 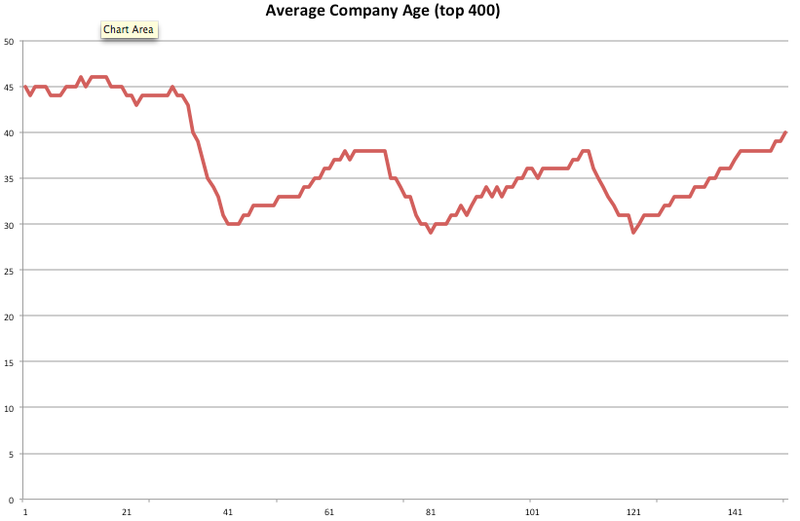 Figure 4 - Company Age with Peace / War and Wonder Cycle plus Communication impacts. What's happening is the system is constantly trying to maintain an age but the peace / war and wonder cycle is causing oscillations arounds this (due to new entrants and failure of past giants). However, the acceleration of the cycle (due to commoditisation of means of communication) is causing a shift downwards to a lower age (and a new stable plateau around which age will oscillate). However this pattern is highly influenced by the ability of the agents to adapt (i.e. if we assume high levels of situational awareness and the ability of companies to evolve then this pattern doesn't happen and a completely different pattern of dominance emerges). You have the same undulation that is caused by peace, war and wonder cycles plus a decline in average age which would be expected from commoditisation of the means of communication and acceleration of the cycle (e.g. Telecommunication, the Internet etc). So, why mention this? Well, I'd argue that what we're experiencing is all perfectly normal. The system is rebalancing to a new company age around which it will oscillate. There are many ways of countering this effect by exploiting predictable change (which is unknown to many) and through the use of ecosystems but that's another post for another day. The good news is that most companies have appalling situational awareness and so it's very easy to exploit. I've only been involved in three startups (all sold to large companies) and I've used these techniques in working for Canonical (we stole the cloud from RedHat) and Governments. It's amazing how much power a little situational awareness and understanding of common economic patterns gives you. After talking with Florian Otel, a smart cookie and always a good chat, I decided to run the simulation above several times to see if we could get it to mimic real life. After a bit of trial an error, I set the starting company age at 50 years, with each step of the model representing 270 days, a low product to product substitution rate, a higher rate of disruption from the 'war' phase of the cycle (i.e. extremely low levels of situational awareness and ability to adapt in the agent), a base time to industrialise of 30 years, a time to disrupt once industrialisation starts of 15 years, a set of peace/wonder and wonder waves each impacting communication, a 7 year rolling average of the top 400 companies, 1,000 competing companies (actors) and an initiation time of April 1937. I ran the simulation 10 times, because each step in the simulation is probability based and each actor therefore has a chance to age or be disrupted or disrupt others in each step. Hence after each simulation is completed, different actors have died or taken over etc. No two simulation runs are identical. 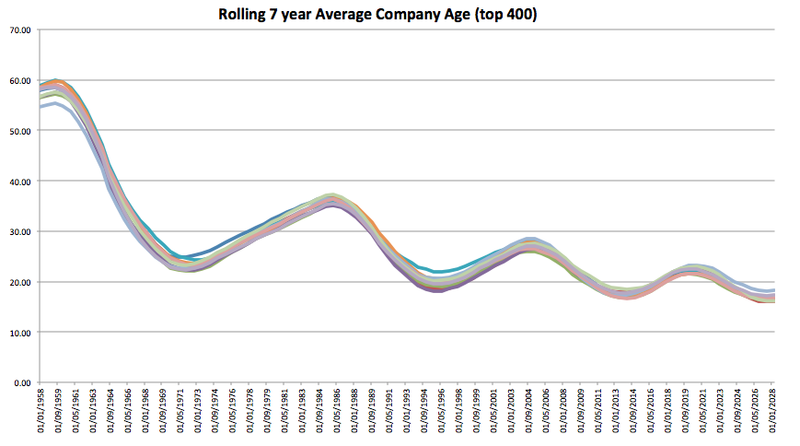 Figure 6 provides the overlapping result of 7 year rolling average of company age for all ten simulations on a single graph. A very strong emergent pattern can be seen which doesn't do a bad job of mimicking real life. It's not a bad approximation to Foster's graph but it's by no means perfect. There's some variation in the simulation when re-run (as can be seen by the different lines in the graph). The times are not perfect (often being out from real life by many years) nor is the shape identical however it should be remembered that in the simulation the agents actions are random but in real life we have the ability to anticipate change - I'll come back to that point. I've overlapped both Foster and in the Simulation on the same company age / time axis scale in Figure 7. Now, not a lot can be inferred by this. It's an agent (actor) based simulation which creates an emergent pattern which approximates real life. It reinforces the internet (1991), cloud computing (2008) and information technology revolution (1967) as key moments of industrialisation of communication. It's not bad though and gives food for thought. However, one key thing was very noticeable and that's the point about anticipation. The model only ever comes close to mimicking real life when the agents themselves act as though they have little to no situational awareness and ability to anticipate change hence creating high rates of disruption in the war part of the cycle. If I'm going to infer anything from the model, it would be the implication that most companies are running blind.